Many seafood sellers are working to raise awareness about the need for sustainable, eco-friendly fishing and the importance of not purchasing seafood on the endangered list. However, it does have one downside: a glut of eco-labels that can make for confusion at the seafood counter. When you’re grocery shopping and you’ve forgotten your Monterey Bay Guide, look for these two labels: Marine Stewardship Council and Friend of the Sea. Fish and seafood with these labels came from certified sustainable and well-managed fisheries. The Marine Stewardship Council’s standards for sustainable fishing meet the world’s toughest best practice guidelines. With their practices and diligent efforts, they are transforming the way seafood is sourced—and helping you get the best produce for you and the Earth. Friend of the Sea is a non-profit non-governmental organization (NGO) working to conserve marine habitats. Products stamped with the Friend of the Sea logo come from sustainable seafood fisheries and aquaculture where the harvesting of seafood leaves no lasting impact or damage to the surrounding environment. 1. Dark and oil rich: anchovies, bluefin tuna, grey mullet, herring, mackerel (Atlantic, Boston or King), Salmon, farmed or King (Chinook), sardines, skipjack tuna. 2. 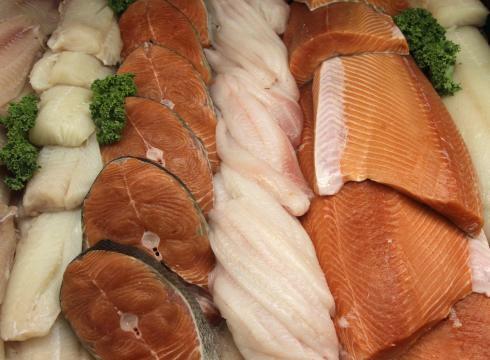 White, lean and firm: Alaska pollock, catfish, grouper, haddock, Pacific cod, Pacific halibut, Pacific rockfish, Pacific sand dab & sole, striped bass (wild and hybrid), swordfish. 3. Medium color and oil rich: amberjack, Arctic char, Coho salmon, Hawaiian kampachi, mahimahi, paddlefish, pompano, Sockeye Salmon, wahoo, yellowfin tuna. 4. White, lean and flaky: Atlantic croaker, black sea bass, branzino, flounder, rainbow smelt, red snapper, tilapia, rainbow trout, weakfish (sea trout), whiting. 5. White, firm and oil rich: Atlantic shad, albacore tuna, California white sea bass, Chilean sea bass, cobia, lake trout, lake whitefish, Pacific escolar, Pacific sablefish, white sturgeon. Budget-conscious families can eat fish. The key is strategic shopping. 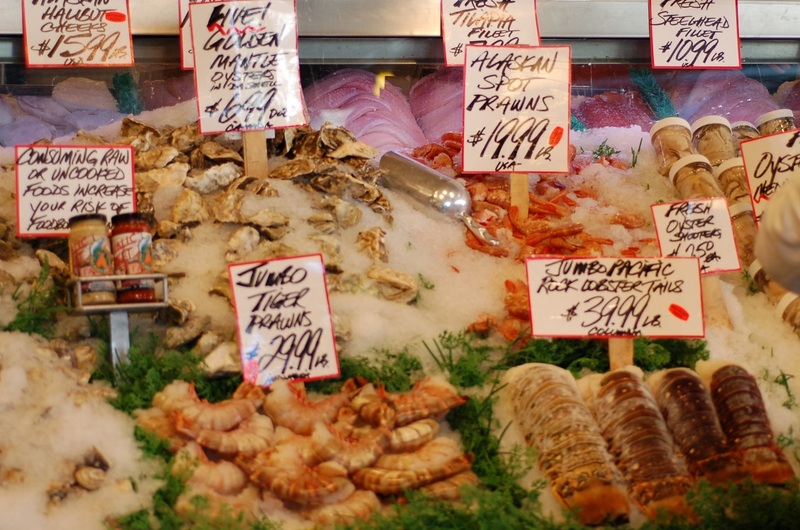 Your seafood seller can point you to budget buys or specials. Grocery stores sell large packs of individually wrapped, frozen fish fillets, usually at a rate discounted from fresh varieties. In-season, fresh varieties are also a good buy; you can enjoy them now and freeze some for later. For top quality, look for “Frozen-at-Sea” (FAS)―fish that has been flash-frozen at extremely low temperatures in as little as three seconds onboard the ship. When thawed, sea-frozen fish are almost indistinguishable from fresh fish, according to the United Nations Food and Agriculture Organization. Frozen wild Bristol Bay sockeye salmon is a good alternative when fresh wild salmon are out of season. Ask your seller for guidance when considering frozen options. Some processors use tripolyphosphates, a type of phosphate sodium preservative that increases moisture in frozen fish fillets (which are often defrosted for sale). The price may be lower, but you’re buying water and preservatives along with your fish. Look for recipes that use less expensive varieties or smaller amounts of pricier seafood. Look for meaty heads, tails and trimmings of larger fish, like salmon, cod and halibut, which are often sold at bargain prices. Simmer or steam, pick off the meat and add to chowder and casseroles. (Don’t forget the cheek meat under the gills). Heads and trimmings are essential to making fish stock, which is more flavorful and lower in sodium that ready-made varieties. Use homemade fish stock in place of water or clam juice in your recipes. If whole fish seem intimidating, try steak-cut or skin-on fillets. The bones and connective tissue of steak-cut fish, like salmon, cod and halibut help retain moisture and prevent shrinkage when cooked. For the same reasons, skin-on fillets are a better choice than skinless fillets. Since these options are less processed, they’re often less expensive. 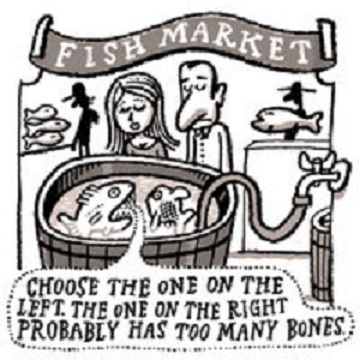 Choose a fish market with knowledgeable salespeople. Fish should be displayed attractively and surrounded by plenty of clean crushed ice. The best approach to buying and eating fish is to aim for variety. Let freshness be your guide. It’s easy to substitute one fish for another, so if the mahimahi looks and smells fresher than the pompano, buy it instead. When shopping, ask for your fish to be packed with a separate bag of crushed ice to keep it cold. Refrigerate whole fish up to two days; fillets and steaks one to two days. Place the fish in a plastic bag, then top with a zip-top plastic bag filled with ice. Thaw frozen fish in the refrigerator. Farmed seafood, also called aquaculture, can provide high-quality fish, can be environmentally friendly and can be a way to supplement the supply of wild-caught fish. When local fish are in season, the price goes down and the quality goes up. Here is a simple guide to what is generally in season but you can also check your State Fish and Game website for additional information on fish from your region. Try fish that you have not eaten before. If you live in the East, try Atlantic black sea bass and weakfish; in the Gulf states try amberjack and black drum; in the Great Lakes region try walleye and smelts and on the West Coast try Pacific sardines and sablefish (black cod). Whole fish shrink less than fillets when cooking, giving you more value for your per-pound price. Whiting, croaker, porgy and Pacific rockfish can be great values. Also, consider summer flounder (sometimes called fluke), red snapper and farmed striped bass and Arctic char. Canned fish is an excellent budget-friendly option. It can also be a nutritious one, particularly varieties like canned tuna and salmon that are low in sodium and rich in omega-3s. Keep them―along with flavorful sardines and anchovies―on hand for fish cakes and salads. Save extra fish from the previous night’s dinner. Leftover fish works well in cold preparations like salads, sandwiches and wraps. Add leftovers to cooked pasta mixed with diced tomatoes, cucumbers and olives. Drizzle with olive oil and fresh lemon juice and a sprinkle of black pepper. 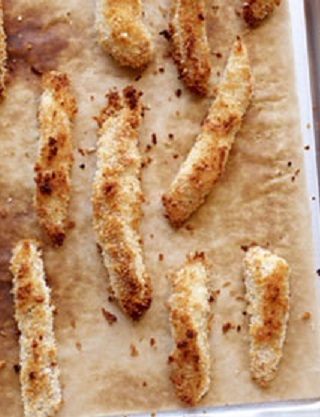 Panko crumbs, or Japanese bread crumbs, are flake-like, coarsely ground bread crumbs used to make crisp, light fried foods and crumb toppings for casseroles. Here is a very simple and inexpensive way to make your own. FYI, these crumbs are also gluten-free. Place the Rice Chex cereal in a plastic bag. Use a rolling-pin to crush the cereal into coarse flakes. You can also pulse the cereal in a processor until it is the right consistency. Don’t overprocess. Season with salt and pepper and any herb blend that you like. Heat the oven to 450º F. Line a baking pan with parchment paper or nonstick foil. In a shallow bowl, beat the egg, onion powder, 1/2 teaspoon salt and 1/4 teaspoon pepper until foamy. Place the panko in a second shallow bowl and add the Italian seasoning. Cut the fish pieces crosswise into finger size pieces. Dip each piece of fish in the egg mixture then coat in the panko crumbs, pressing gently to help them adhere; transfer to the baking pan. Bake until golden brown, about 10 to 12 minutes. Serve with a sauce of your choice. Cook orzo pasta according to package directions. Drain and return to pasta pot; stir in tomatoes, 1/4 teaspoon salt, parsley and 1/4 teaspoon pepper. Set aside and keep warm. Combine remaining 1/4 teaspoon salt, remaining 1/4 teaspoon pepper and flour in a large shallow dish. Dredge fish in the flour mixture. Melt 1 tablespoon butter in a large nonstick skillet over medium-high heat. Add fish to the skillet; cook 1 1/2 minutes on each side or until fish flakes easily when tested with a fork and is lightly browned. Remove fish from the pan; keep warm. Add wine, juice and capers to the skillet; cook 30 seconds. Remove from heat. Add remaining 2 tablespoons butter to the skillet; stir until butter melts. Pour sauce over the fish and serve with the orzo. Great dinner for a cold, rainy night. Heat a heavy soup pot over medium heat and add the bacon. Cook until the bacon is golden brown and crispy, about 10 minutes. With a slotted spoon, remove the bacon and reserve, leaving the fat in the pot. Add the onion, celery, thyme and bay leaf to the pot and cook, stirring occasionally, for 8 to 10 minutes, until the vegetables are softened but not browned. Sprinkle in the flour and cook, stirring, another 2 minutes. Add the potatoes, broth and clam juice and bring to a boil. Then reduce heat to low and simmer until the potatoes are tender yet still firm, 5 to 7 minutes. Season generously with salt and pepper. Add the cod and corn. Do not stir. Cook for 5 minutes. Remove the pot from the heat, cover and allow the chowder to sit for 10 minutes (the fish will finish cooking during this time). 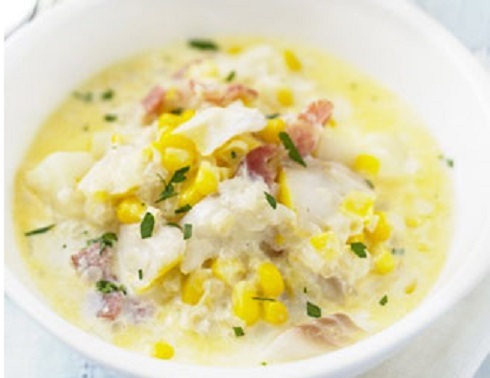 Return chowder to low heat and stir in the warmed half and half, gently to avoid breaking the fish into small pieces. Bring chowder to serving temperature over gentle heat, uncovered. Sprinkle reserved crisped bacon and parsley on top and serve with a side salad and cornbread. Stretch your fish dollars with kebabs. Add several vegetables to make this dish even more economical. Zucchini and different colored peppers are good additions. Preheat the broiler. Weather permitting, you can grill the kebabs on an outdoor grill. Place fish and bell pepper in a shallow dish. Combine the pesto with the vinegar and drizzle over the fish and vegetables; toss to coat. Let mixture stand 5 minutes. 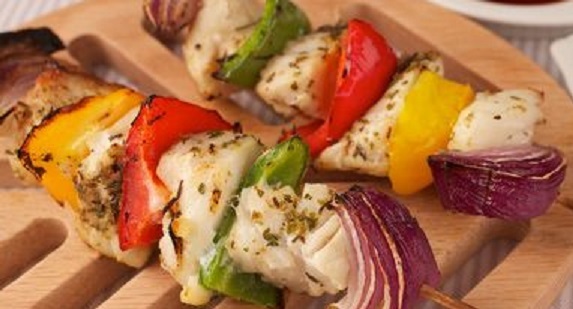 Thread fish, onion and pepper alternately onto each of 4 (12-inch) skewers; sprinkle evenly with salt. Place skewers on a jelly roll pan coated with cooking spray. Broil for 8 minutes or until desired degree of doneness, turning once. Trout is a fish that you’ll be able to buy at many markets without hurting your wallet. The flavor of trout is outstanding. Place fish in a greased shallow 3-qqart baking dish. In a small bowl, combine the sour cream, cheese, lemon juice, onion and salt; spread over fish. Sprinkle with paprika. 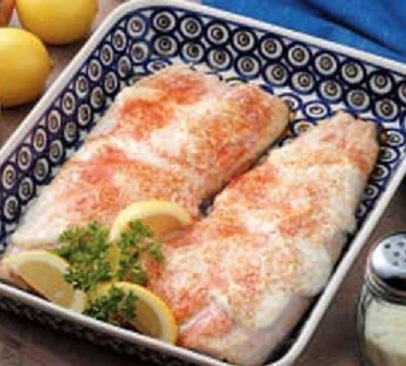 Bake, uncovered, at 350° F for 20-25 minutes or until fish flakes easily with a fork. Serve with lemon wedges. Great post! We have been buying more whole fish and roasting it in the oven (just like you would roast a chicken). VERY budget friendly, super easy to make and you get nice bones and little parts to make fish stock. Now it is our preferred way to eat fish! Thank you – that is a great tip. Appreciate your sharing it. What oven temperature do you use? I usually coat them with olive oil and spices and roast them at 400 for about 30-40 minutes, depending on how big or small the fish is! I have a craving for fish now… great recipe ideas. This post is so helpful! I’ll definitely be looking for Friend of the Sea and Marine Stewardship Council labels next time I buy seafood. Thank you very much, Mary Frances. I find any assistance with helping me know where our food came from as beneficial. This is a great post Jovina. So often we just buy food not knowing where it came from or how it was raised. I try to keep up, but I know there are times when I’m blindly buying something I know little about and would most likely disapprove. Great to bring awareness, good post. Thank you so much. I am glad you found value in this post. I appreciate your comments. Love fish….thanks for the great overview of fish types….and ideas for making them delicious to eat. Thank you so much for for your gracious comments.